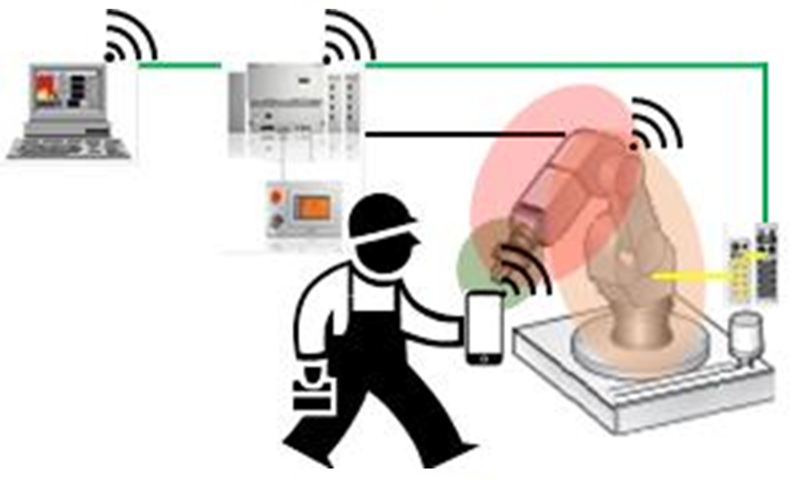 In previous blogs, we discussed how “Safety Over IO-Link Helps Enable Human-Robot Collaboration” and “Safety & Productivity”. We’ll build on these blogs and dive more deeply into two robot collaborative operating modes: Safety-Rated Monitored Stop (SRMS) and Speed & Separation Monitoring (SSM). Human-robot collaboration has received a lot of attention in the media, yet there is still confusion about the meaning and benefits of various types of collaboration. In a previous blog we briefly discussed the four collaborative modes defined by the global standard ISO/TS 15066. The most well-known mode is “power & force limiting”, which includes robots made by Universal Robots and Rethink. As the name implies, these robots are designed with limited power and force (and other ergonomic factors) to avoid injury or damage, but they are also slower, less precise and less powerful than traditional robots, reducing their usefulness in many common applications. The safety-rated monitored stop (SRMS) and speed & separation monitoring (SSM) modes are very interesting because they allow larger, more powerful, traditional robots to be used collaboratively — though in a different manner than power & force limited robots. The updated standards allow the creation of a shared workspace for the robot and human and define how they may interact in this space. Both SRMS and SSM require this shared workspace to be monitored using advanced safety sensors and software, which create a restricted space and a safeguarded space. With SRMS, the robot stops before the operator enters the collaborative workspace — this requires a safety sensor to detect the operator. Similarly, in SSM the goal is to control the separation distance between the human and robot, but it can be dynamic, rather than static as in SRMS. The SRMS separation distance can never be less than the protective distance and this requires sensors to verify the separation. The robot’s restricted space is a 3-dimensional area created to limit where the robot can operate. In the past this was done through limit switches, hard stops or sensors such as Balluff’s BNS; now the standards have been updated to allow this to be done in software with internal robot feedback that can dynamically change to adapt to the robot’s programmed operation. The robot controller can now restrict the robot’s motion to a specific envelope and monitor its actual position against its programmed position within this envelope using software tools such as Safe Move or Dual Check Safety. The safeguarded space is defined and monitored using safety sensors. The robot might know and assure its own safe position within the restricted space, but it doesn’t know whether or not a person or obstruction is in this space, therefore a safeguarded space needs to be created using safety sensors. Advanced sensors not only detect people or obstructions, but can also actively track their position around the robot and send warning or stop signals to the safety controller and robot. Safety laser scanners, 3D safety cameras and other safety sensors can create zones, which can also be dynamically switched depending on the operating state of the robot or machine. Closely coordinating the restricted space and safeguarded space creates a flexible and highly productive system. The robot can operate in one zone, while an operator loads/unloads in a different zone. The robot sensors monitor the restricted space while the safety sensors monitor the safeguarded space – and when the robot moves to the next phase of operation, these can dynamically switch to new zones. Warning zones can also be defined to cause the robot to slow down if someone starts to approach too closely and then stop if the person comes too close. 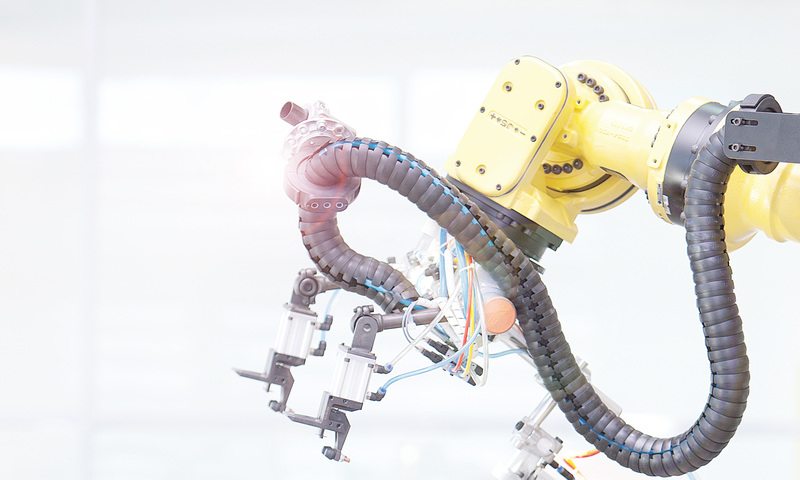 Linking the restricted space and safeguarded space to create an effective, closely coordinated human-robot SSM/SRMS collaborative system requires several elements: a high performance robot and controller with advanced software (e.g. Safe Move), a fieldbus and a variety of built-in and external sensors (standard and safety). Significant growth in robot collaborative applications utilizing safety-rated monitored stop (SRMS) and speed & separation monitoring (SSM) will occur as robot users strive to improve productivity and safety of traditional robot systems – especially in applications requiring faster speed, higher force and more precision than that offered by power & force limited robots.